This free online calculator will help you to find the area of a square. Using this online calculator, you will receive a detailed step-by-step solution to your problem, which will help you understand the algorithm how to find square area. Area of square is equal to square of its side length. Area of square is equal to half of square of its diagonal length. 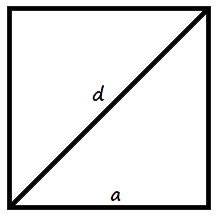 d - length of the square diagonal.